In medium saucepan, combine flour and milk. Add wine and seasoning; whisk until smooth. Cook over medium heat, 4 to 6 minutes, or until mixture is thick and bubbly, stirring constantly. Cut turkey kiebasa in 1/2- inch slices. 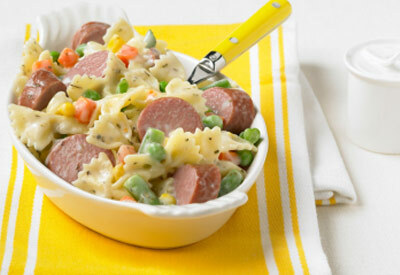 Fold into sauce, kielbasa, vegetables and pasta; reduce heat to medium-low. Cook 8 to 10 minutes or until hot and flavors are blended.